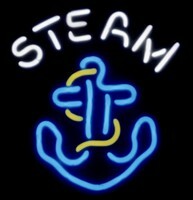 Officially licensed Anchor Steam neon beer sign. Pledge your allegiance to one of America's finest brewed treasures with this cool 3-color neon. It adds the perfect touch to any bachelor pad, bar, or game room. A great sign for the true Anchor Steam enthusiast. Solid state transformer backed by full 3-year warranty. Sign is a 100% hand crafted, with quality 1/2" diameter neon glass tube.